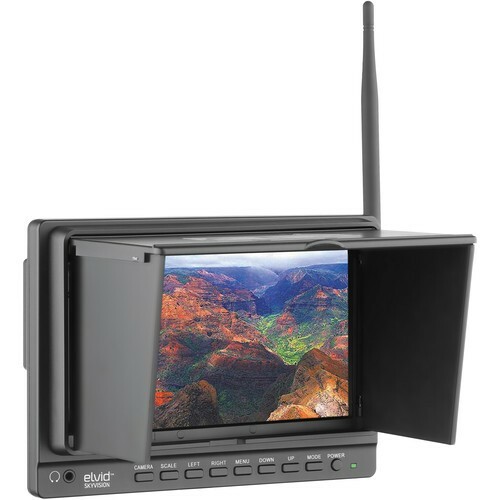 Combining analog and digital signal inputs, the SkyVision WCM-758G 7"" Wireless LCD Monitor is suitable for use as a first-person viewing (FPV) device for use with the wireless feed from optional RC aircraft mounted cameras (Aerial Imaging Platforms). It features a 7"" screen with 1024 x 600 resolution, which allows you to view either SD or HD video with minimal scaling or windowing providing a large image no matter what the resolution of your video. It supports 32 channels across 4 wireless bands and incorporates a built-in 5.8 GHz receiver, which is compatible with optional DJI transmitters, as well as other optional 5.8 GHz transmitters. 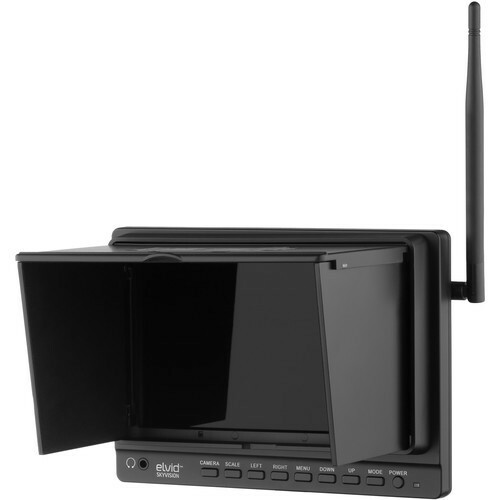 The monitor takes an RF signal via a single antenna, and as it is an analog signal, the monitor allows the image to degrade but remain visible as the signal fades, instead of displaying a blue or black screen as most digital monitors will once the signal falls below a certain threshold. 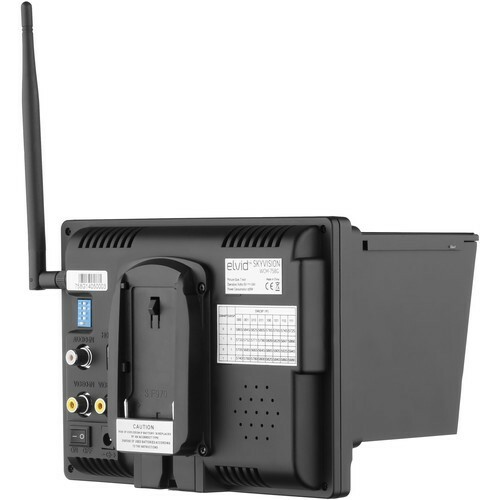 It also accepts a composite signal, which features a loop through output, and an HDMI input. 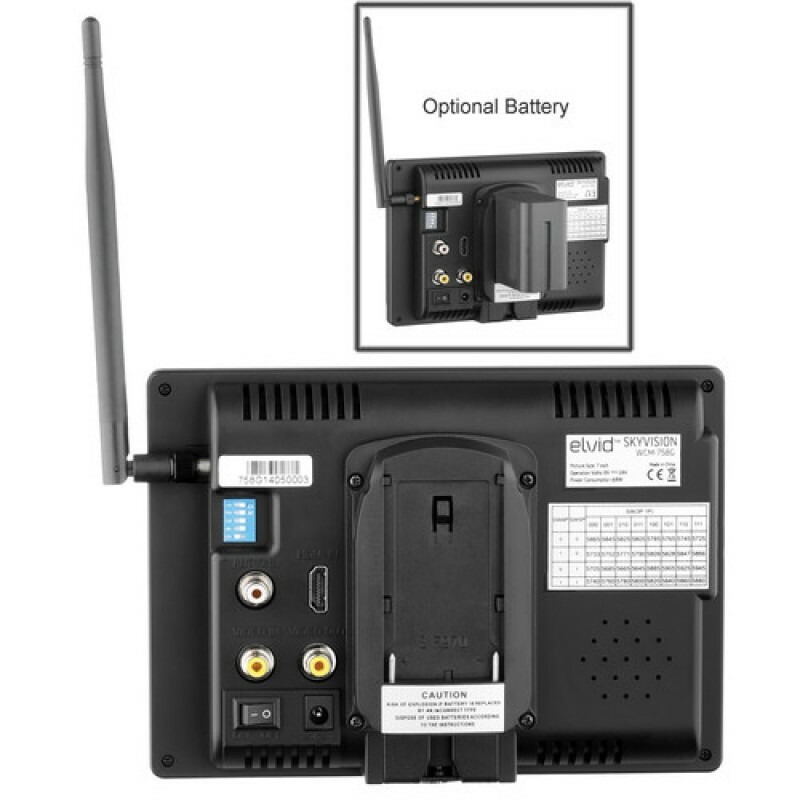 The monitor is powered by optional Sony L Series type batteries, via the built-in L type battery plate. 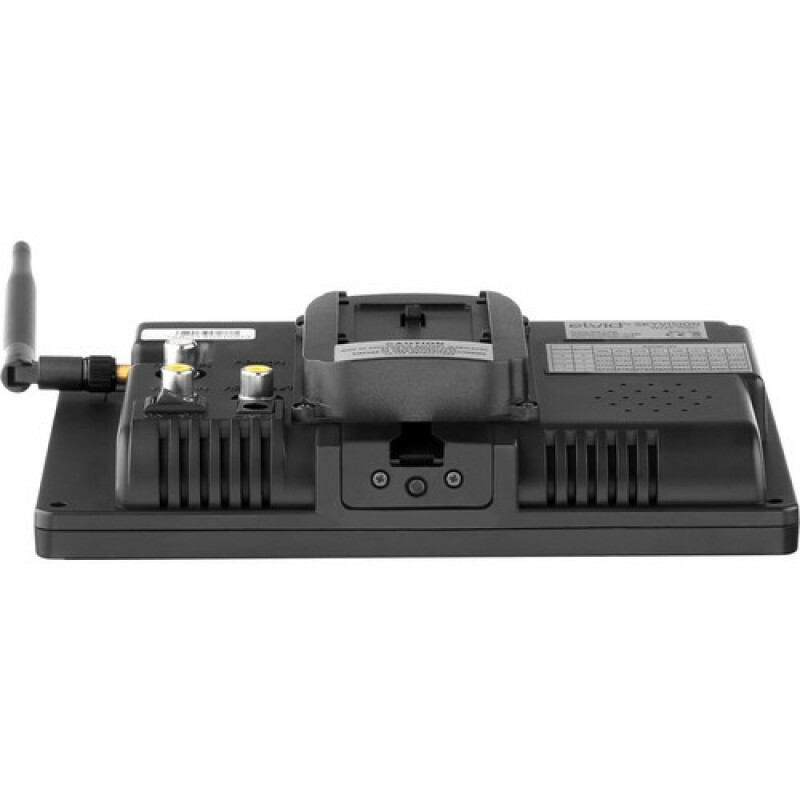 You can also use it with an optional AC power adapter if you want to use it from an AC power outlet. A removable plastic sun hood provides protection from the glare and direct exposure of the screen to sunlight. The hood features a top and two side flags, that you can collapse while the hood is mounted to the monitor; this configuration provides protection for the monitor screen during transport or storage. The Elvid WCM-758G SkyVision features a built-in 5.8 GHz receiver that works with your 5.8 GHz composite video transmitter. 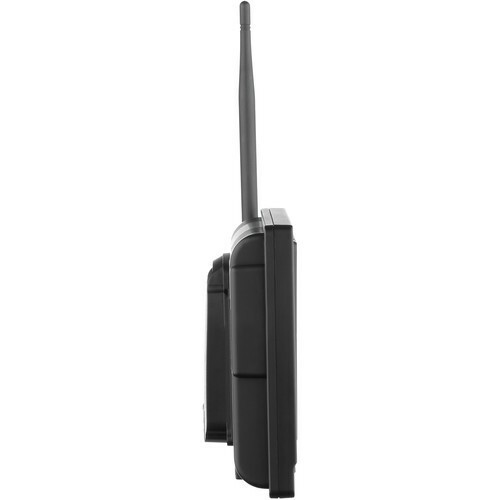 It is well suited for use with optional quadcopter-mounted cameras and can also be used on location with other wireless camera systems. SkyVision offers a variety of wireless options, with 32 channels over 4 bands. 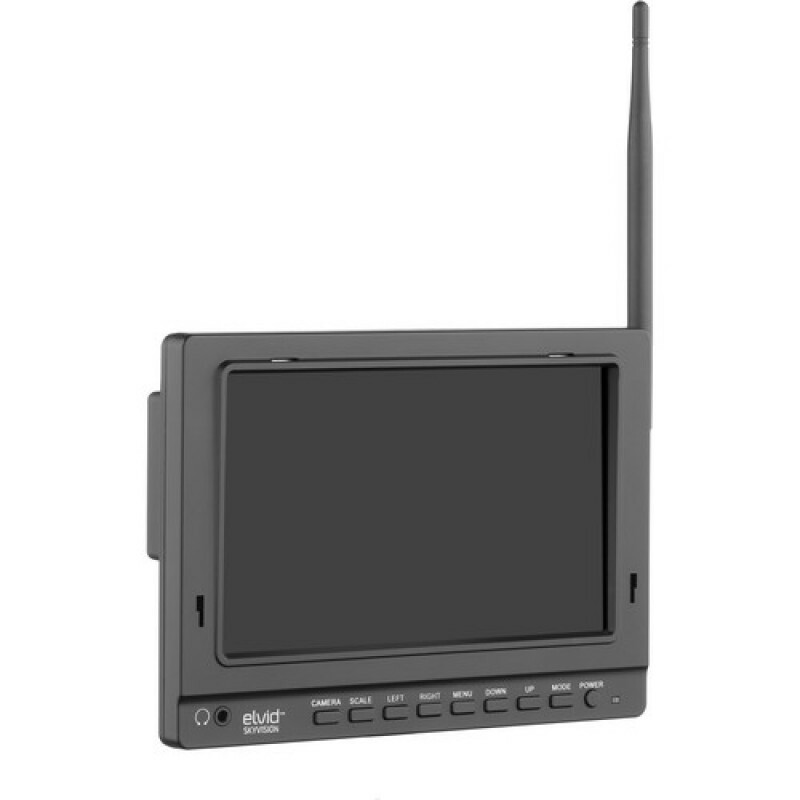 User selectable DIP switches allow you to tune the monitor's receiver to the cleanest channel. 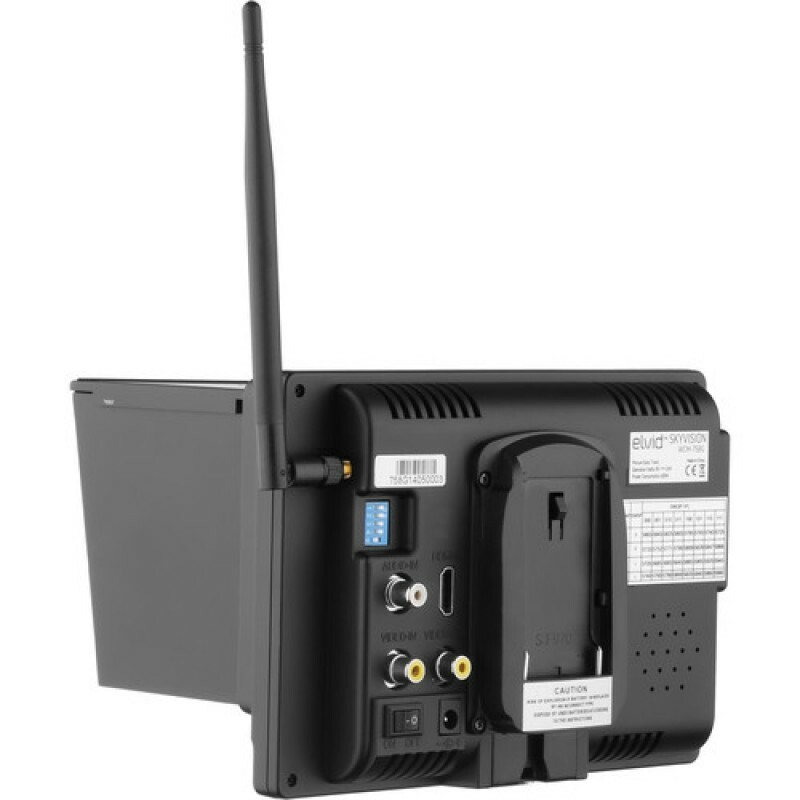 For added flexibility, the SkyVision is also equipped with a loop through composite video input/output for use as a wired standard-definition video monitor with SD composite video sources. 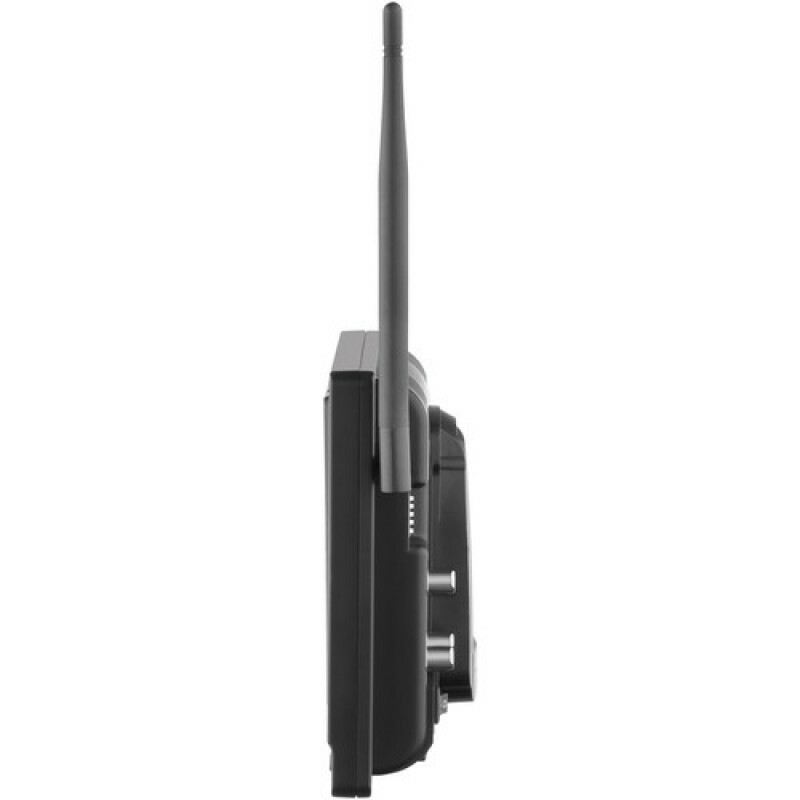 Use the SkyVision's onscreen menu for convenient access to all of the setting configurations and advanced tools. Front panel buttons enable easy navigation within the menu and submenus. The Check Field mode helps you calibrate the monitor by displaying only the selected color onscreen. Choose from red, green, blue, or mono for a grayscale image. Select from the presets 9300, 7500, and 6500 K to optimize the screen's color temperature. Advanced users can also configure a custom setting. The Color Temp setting is available when the monitor is set to HDMI input. Selectable aspect ratios allows you to scale the onscreen image to fit either 16:9 (native) or 4:3. If you're shooting on a DSLR, use the Camera mode to scale the incoming video signal to fill the screen. 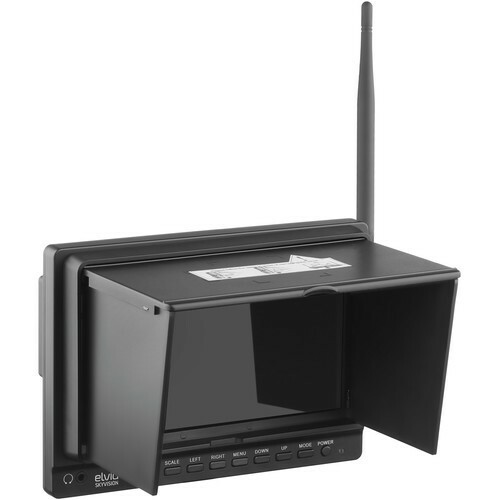 The buttons on the front of the monitor function as quick shortcuts to Camera, Focus, and Check Field modes, the safety frame and center markers, and the onscreen volume bar. The monitor can display menu features in the following languages: English (default), Simplified Chinese, French, Italian, German, Spanish, Japanese, Korean, Russian, and Portuguese. 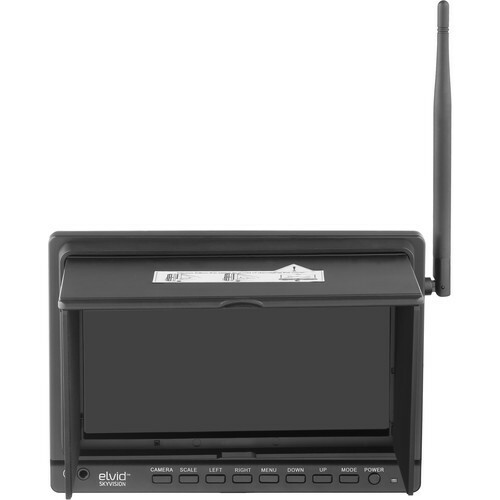 The included collapsible sunshade prevents glare on the monitor's screen. It is removable and fits on any optional 7"" Skyvision monitor from Elvid. It's easy to monitor your incoming audio signal with the SkyVision, whether it's from the built-in speaker or the 3.5 mm headphone jack. Volume is adjustable via the shortcut buttons or the onscreen menu. 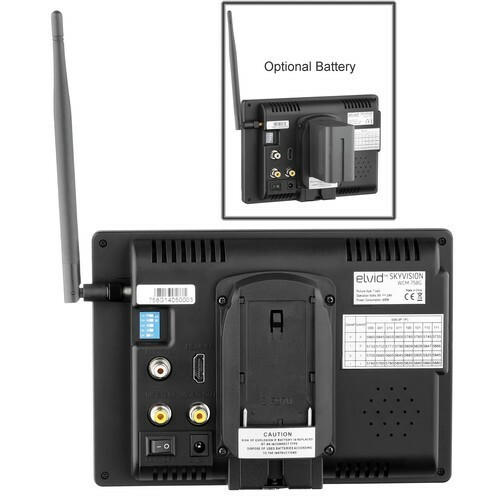 The built-in battery plate accommodates Sony L-series type batteries. Adding an optional 12 V DC adapter will let you power the SkyVision from a wall outlet or other AC power source. The LED power indicator provides a visual confirmation when the SkyVision is in standby mode or ready to go. The monitor incorporates a 1/4""-20 threaded mounting hole on the bottom of the unit.